Come to the 8th edition of the Master in Applied Narrative Medicine, together with other educational programs in narrative medicine addressed to healthcare professionals, we would like to interview participants of our courses to know, from their direct testimony, whether such a structured approach with narrative has been integrated in their clinical practice, in different contexts of care, and with what outcomes. After several years of work spent diffusing Narrative Medicine as a discipline with the same dignity than Evidence Based Medicine, indeed, we believe that the time to collect the first evidence on the real impact of this approach, for patients, families, and healthcare providers, has come. We realized a brief survey diffused online to healthcare professionals with different specializations, ages, geographical origins, and also different times from the educational path, but all of them strongly interested in a more inclusive approach towards people, their values, their stories. Most of the 80 respondents were women (77%) – which corresponds to the average gender composition in our classes, mainly doctors (40%) and nurses (26%). Actually, our classes usually are markedly multidisciplinary – and this is wonderful – since several different healthcare professionals are together: psychologists, educators, experts in healthcare communication, rehabilitative therapists, pharmacists, and many other figures. The most represented Italian Region was Lombardia (29%), but it is possible to say that we obtained a national mapping, with 17 represented Italian Regions, such as Piemonte, Emilia Romagna, Lazio, Sicilia, Toscana. Although the specific center of reference was not required, public hospitals and Local Health Authorities (ASL) were the most cited. What did we ask our participants? 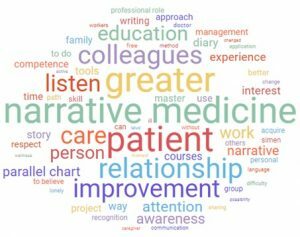 We asked them whether the narrative medicine educational path generated improvements, worsening or no changing at the individual level, in the relationships of care, in the relations with other colleagues, in their professional career. The acquisition of the narrative tools is firstly useful to themselves, to grow up at the personal and intimate level, as experienced by 95% of the healthcare professionals, 65%of whom spoke about “considerable improvement”, more awareness, better ability to listen to and give attention to the person: “I feel more calm, at the moment of the encounter with my patients and their families”; “I was able to shape my professional career with the narrative approach, that I have always felt necessary and that I was used applying “unofficially” in my clinical practice. Knowing that I could have the possibility to formally officialise the expression of human dignity, gave new energy to me and my healthcare facility.”; “I am aware of having at disposal a new effective tool, to carry on my work with more personalization and wellness”. Also, the relationships of care resulted improved (85%), “considerable improved” in 44% of the cases; the ability to listen to, together with the acquisition of narrative tools, improved the quality of care and the communication: “I am more attentive. I usually try not to stop patients when they are speaking. I usually listen to all the voices that could have something to say”; “Better ability to go beyond the clinical case and to reach the ill person”. 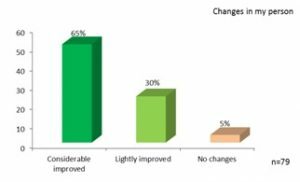 The relationships with collegues improved (65%), even if less markedly: “lightly improved” 41%, “considerable improved” 24%, “not changed” 35%. In several cases, the relationships improved the collaboration and the reciprocal comprehension, thanks to the first interest demonstrated by collegues: “It helped me to create relationships characterized by real collaboration and sincere sharing of daily problems. I learned to be in a team”; “a more open communication style allows to establish deeper relationships and better collaboration among the team members. I tried to import narrative medicine into my activities, and this was positively accepted”; “Sharing stories of people I take care of, amplifies all the team engagement.”. However, introducing the narrative medicine approach with its potential benefits is still difficult: “my relationships improved only with the colleagues already familiar with narrative medicine. Who is skeptical usually sniggers or looks at you with suspect ”; “I often find a significant resistance in proposing the narrative approach in my context of care”. Therefore, narrative medicine sometimes connects and reveals new ways of the work team, but other times it remains confined as a “private practice”, only among those with more attitude toward narrative, willing to dedicate time to patients and their stories; sometimes it is still a lonely work. 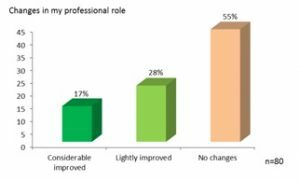 The professional role tends not to change (55%), and this could be a predictable result since up to now an official and formal approval of narrative medicine does not exist. However, There are several cases of improvements, also considerable, with higher professional recognition and identity, and this is due to the application of narrative medicine: “My role has not changed, the competence has enriched”; “I am recognized for my trustworthy relational competence”; “my healthcare managers officially approved my narrative medicine approach, allowing me to organize and manage my times for listening to, writing and readings”. The more used narrative medicine tools vary: parallel charts, semi-structured stories, diaries, free writing, and of course the pure listening to the patient, that has been considered a tool. They have been applied at 360 degrees, directed to people in care, families and also colleagues, to indicate a constant strain to involve all the team members in the use of this approach, and not to consider it as “a private practice”. Concerning healthcare management, we discovered positive news. 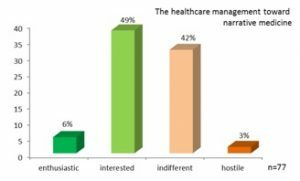 At the question “What is the attitude of your healthcare managers toward narrative medicine and medical humanities?”, 55% of healthcare management were described as “interested” (49%), even “enthusiastic” (6%). Of course, a consistent group of indifferent healthcare managements remains (42%), but the revealed interest indicates that something is progressively changing., Through the example and little concrete steps, it is possible to reach and dialogue with healthcare managers, bringing the concept of global care of the person – healthcare professionals included – at systemic level: “It allowed the organization of a narrative medicine course for doctors.”; “researches led to moments of reflection and allowed changes at organizational and educational level”; “The possibility to consider a narrative medicine project exists”; “managers are indifferent in general; they are interested only to financial interests for them”; “Maybe ‘indifferent’ is not the correct word. I would say that managers underestimate the importance and the need for wellness both for healthcare professionals and relationships of care”. The data emerged on the existence of a network for the application of narrative medicine was less positive, since 68% of respondents do not benefit from this. Yet, there is the Italian Society of Narrative Medicine (SIMEN), a point of reference for 14% of the healthcare professionals. the several initiatives in narrative medicine are maybe still too local and fragmented on the Italian territory to be considered a referent model. The network is a point of interest to be reinforced, not only by ISTUD Foundation but also for those who apply narrative medicine and humanization of care. 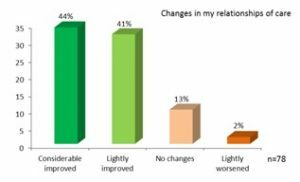 From this survey, we found newly motivated and enriched healthcare professionals, even after years from the educational path, full of resources to make available for the healthcare service, but still too much isolated in facing the resistances in their contexts of care. Indeed, what do they desire today to continue to use narratives in healthcare? The most frequent answer was the education for the healthcare professionals (18%), addressed to the indifferent, suspicious, resistant to the use of narrative approach colleagues, who probably don’t know its potentialities, and suffer for the daily paces of work, rather than being hostile. This is the reason why the first desire is the education, followed by awareness projects and initiatives, more structured and shared narrative medicine initiatives , and the organization of models to be applied to different contexts of care: “a good course, firstly for my department (students in medicine and nurses) and then open to others”; “The change begins with a little step, followed by many many others: I will try to make the educational managers aware of the importance of planning courses in narrative medicine for all the healthcare professionals of our department and territory”; “I believe to be on the correct road: at the moment, I am not able to introduce massively initiatives, but I think it could be useful to pay attention to some well-structured projects”. The survey was brief, however, we wanted to let more ‘narrative’ and open spaces to personal comments and considerations. The most recurrent words reflect and enrich what our participants wanted to testimony, and what is important for them: the relationships with people in care and colleagues, the improvements of the care, the listening to, the education, attention and awareness, the tools and practical applications in the daily practice. This project could be further extended, for examples considering a control group composed of healthcare professionals who did not attend a specific course on humanization of care and narrative medicine, to comprehend their professional living and relationships of care, and comparing the levels of wellness between the two groups. It could be the occasion to reduce the resistance and the suspects among the healthcare managers defined as “indifferent”. Thanks to all the participants to our courses who we met in these years, and thanks to whom dedicated their time to this survey. Your words are a treasure for us, to continue to foster more healthcare professionals towards a new approach of care, integrating clinical parameters with people’s values, and to maintain a community of experts referents in narrative medicine.